Liberal Judaism’s Surat-Shaan Knan has addressed the National LGBT Police Conference (pictured), the first time the annual event has tackled the subject of faith. Police attending the conference were also able to view the ground-breaking Twilight People: Stories of Gender and Faith Beyond the Binary exhibition, which Surat-Shaan founded and project manages. Thanks to generous support from the City Police, this Twilight People Pop Up touring exhibition #TPpopup was launched at the Guildhall vaults as part of the Conference. Twilight People is supported by the National Lottery through the Lottery Heritage Fund and hosted by Liberal Judaism. 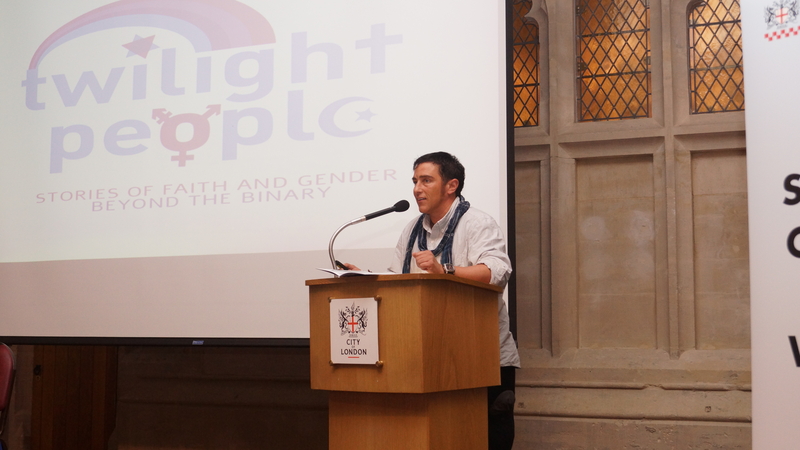 Surat-Shaan was also part of a panel on LGBTQI+ and faith issues at New Scotland Yard in June, alongside speakers including Commander Mak Chishty – the Metropolitan Police lead for community engagement. On July 28, he will speak at the Herts Lesbian and Gay Liaison Officer and LGBT Engagement Conference. Surat-Shaan will take part in a ‘Question Time Panel’ and talk about issues around policing that were identified as a result of stories collected by Twilight People.